The Department of Design Engineering and Mathematics at Middlesex is a renowned centre for the study and application of Product Design and Design Engineering. Graduates from their courses have gone on to work for the likes of Dyson, Airbus, Lego and Huf Haus, amongst others. Being in the heart of London, there is a very international and multi-cultural feel about the campus and this adds to the ambience of their historic college buildings. Design thinking and real-world problem solving are central to the research and teaching ethos at the University, and they are proud to offer courses which immerse students in practical projects from day one. This is very much the attitude and motivation that led the Department to purchase a Baxter so quickly once they had seen it in operation. Nick Weldin, a Technical Tutor at the Department recalls how he first met Baxter. “Active8 Robots were keen to show off Baxter and do a demonstration for us. We thought it would be a good idea to schedule the demonstration for one of open day public events and have it in the atrium reception area of the University. 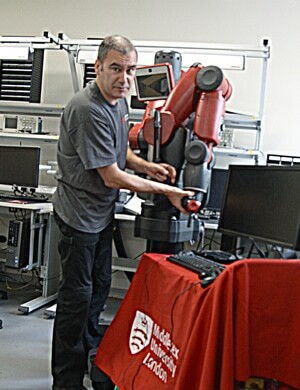 Prof Martin Loomes (Dean of School of Science and Technology) and Prof Mehmet Karamanoglu the (Head of Design Engineering) observed them setting it up to see if it really was practical to move the robot around and set it up as quickly as Active8 Robots said. And it was! We had various staff, students and others during the open day come and take a look at Baxter. I talked to a couple of students who were coming up to their final year and asked if they would be interested in doing a project on Baxter in their final year. They were very positive and so we talked to the Dean about seeing if we could purchase Baxter quickly as the final year projects were not that far off. They already had learned a bit of ROS and they all said “Yes, we would!” So I caught the dean as they were packing up and suggested that if we bought now, rather than the end of the academic year, we could get some student projects working on Baxter projects straight away. Calum Knott was one of the 3rd year undergraduates whose design engineering project used Baxter in the following semester. 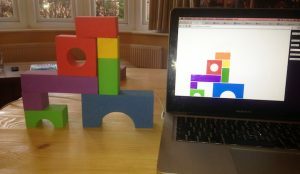 His project was to get Baxter to recognise a set of children’s building blocks and then to assemble them into a given arrangement. Calum’s blog details his first work with Baxter as he studied towards his dissertation. “Although we have used other systems for teaching, Baxter looks like the iconic robot and it’s very obviously a robot to anyone who looks at him. We were very taken with the arms on Baxter, in most of the industrial world the work is done using robot arms so we are keen for our students to learn and understand these systems” says Weldin. “The nice thing about Baxter, for the price, is that you get two arms. So for student work you can have a team working on each arm independently or have them work on co-ordination issues with the two arms together. We hadn’t appreciated at the time we purchased that we could have two groups working on Baxter simultaneously. Weldin concludes “Our hope is that when our students leave the course they will be prepared and head into the manufacturing industry. There is this myth that manufacturing has gone away from the UK – and there clearly has been a big decline in many large scale manufacturing facilities – but there has equally been a large increase in the number of smaller manufacturing organisations who are working on new designs, proof of concept and being first to market.